My friend was reluctant to let me leave Baltimore on the Cape Clear ferry when she saw the size of the waves. It’s a good job she couldn’t see past the harbour promontory; out on the Atlantic the waves reached four metres high in places. Places we were travelling through. As the last ferry of the day pulled away from Baltimore harbour – the rest were cancelled due to weather conditions – I sent a text to my husband in case he was worried. 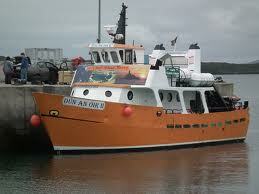 Our home overlooks the waters to Cape Clear and he would see the swells. His reply? “I’m used to the sea, I won’t get sick,” I laughed. And I didn’t. The ferryboat man was partly impressed, partly disappointed. Especially since the trip wasn’t an easy one. The ferry lifted and rolled with the waves, pitching and lurching. Sometimes with warning, sometimes without. Trust me, these things will help. 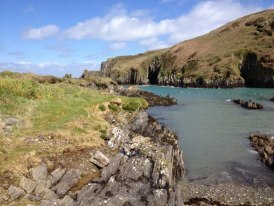 The roughest part of the journey was turning into the mouth of Cape Clear harbour; this is where the seas are wildest and cross currents rage. At times, the engine had to be cut off to pull back, preempting the wall of water coming our way. Waves spluttered over the cabin and drowned the deck. Thankfully, there was cargo on board which steadied the boat. And of course, there were great skippers steering the boat, with a wealth of knowledge under their belts. Although it was fun, I was glad to step onto land and it took about half an hour for my legs to stop wobbling. It was like they were still following the ebb and flow of the tide. When I called my husband to et him know I was safe, he told me he’d climbed the hill with our dog, Franklyn, and watched the ferry pitch and flail in the sea through the binoculars, waiting until we’d turned safely into the harbour. Now on Cape Clear, the island is silent. There are no tourists and few islanders. The air is thick with rustling trees, waves bashing against cliffs and birdsong. A wren dashes out from under a twisting briar and crosses my path, cocking his tail as he perches on an old stone ditch to welcome me. I’m the worst sailor in the world… I’ll definitely follow your advice the next time I find myself on a boat! The way you describe it sounds so exhilarating and joyful, it almost makes me want to take a trip across the waves right now.